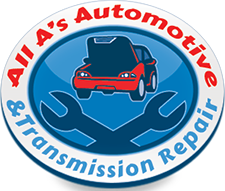 All A’s Automotive & Transmission Repair is a family owned and operated business with the experience and resources necessary to treat your vehicle the way it needs to be treated with careful, trustworthy attention. Our thoroughness and experience have earned us a sterling reputation for excellence, so you can rest assured you’re in good hands when you bring your car to us. In addition, we recently opened a transmission shop at the same address, so transmissions are rebuilt on site. To keep your vehicle on the road and running smoothly, give it the pampering it deserves read your owner’s manual, follow the recommended maintenance schedules, and always have it checked and serviced regularly by the skilled and experienced mechanics at All A’s Automotive & Transmission Repair.